Depending on which report you’ve read, Brits spend between 6 and 10 months of their lives complaining about the weather. We grumbled because it was too wet in March and then put our winter coats away in mid April when we saw a glimmer of sun only to get them down a week later when the heavens opened again And now we are out in t-shirts and shorts once more. All of which provides a wonderful source for a moan about ‘will it make it’s mind up’. So how have companies tapped into this nation obsessed by the weather? Here are three examples of organisations who have used the weather conditions to demonstrate their value to their customers through enhanced customer experiences. This isn’t unique to Chessington. In fact, Blackpool Pleasure beach and many others offer it too. 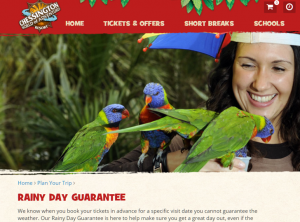 For Chessington it’s a wonderfully simple message, ‘you don’t need to stay away because of potential bad weather’. Not only do they highlight the park is typically quieter when it rains, so you get to experience more, but they offer a free like-for-like return day pass if you come on a day it rains. Just one hour of rain entitles you to a return trip. Lifeboat crews often rely on their eyes to spot a person in the water. When the weather is against them, it’s a race against time in poor visibility. The lifeboat can only cover a small space at a time. 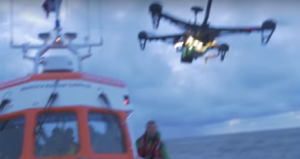 Direct Line have invested in a batch of drones for Caister Lifeboat rescue. These coordinate as one using mobile-controlled “mesh networking” tech meaning they can cover a far greater reach than before. It means the lifeboat crew can find people at sea five times faster. For me this demonstrates to customers a couple of things about Direct Line; 1) where technology can reduce risk, they will use it and 2) they are always thinking about how to help others. These are two attributes that are easy to say, but hard to demonstrate unless a claim is made. They call it high performance fixes for everyday problems. With initiatives such as this, Direct Line project the experience their customers can expect should something go wrong. ‘If this then that’ is a principal logic which connects several devices together to trigger actions based on conditions identified between them. For instance when driving home in your BMW, Hive recognises the temperature around the car, so it can change the heating settings at home. 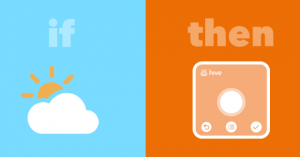 Similarly, if you are out having a run and connect your Strava fitness app, Hive Active thinking will track your closeness from home and make sure the hot water is read for a bath (Strava is less about the weather, but a nice illustration all the same). All three of these, and others such as framing management apps, are great examples of how brands can take something as unpredictable as the British weather and use it to improve their own customer experience. How do you get to ideas like this? You need to think beyond the conventional customer journey map. Start at the end rather than the beginning. Understand the exceptional customer fulfilment that can be achieved and work back. If you go beyond the map you can discover new customer opportunities which you can fulfil with existing assets. If you stick to close to touch-point management, you’ll miss the disruption storm that’s going on around you. Of course, keep close to touch-points to deliver an excellent (but often expected) customer experience, but stand back from it to find exceptional experiences to shine. For more on disruptive customer experience techniques contact us and find out how we can help improve your customer experience. Posted by Christopher Brooks, Customer Experience Specialist, Lexden Group, home of the independent customer experience thinkers.